Whether you’re celebrating Earth Day or want to kick off the 2019 taste of science festival, join us at Cage Brewing for three local speakers sharing their research over a glass of Galaxy Cat APA or Mango Bob’s IPA (or any number of their craft beer selection). Ryan Venturelli studies Antarctica to better understand what changes in ice over thousands of years means for the future of the planet. Jennifer Sedillo is the program director of the USFSP Brewing Arts Program, but for tonight she's talking about the Science of Taste! Subglacial lake science: from space lasers to sediments - Antarctic subglacial lakes remain one of the most unexplored regions of Earth's surface. Throughout the last decade, almost 400 of these lakes have been identified with the use of multi-mission satellite altimetry (SPACE LASERS), but only two have been directly sampled. As part of the Subglacial Antarctic Lakes Scientific Access (SALSA) project, Mercer Subglacial Lake was recently sampled (January, 2019). Here I will discuss preliminary findings and what this means for the way we view Antarctica. About Ryan: PhD Candidate at USF-CMS using novel geochemical techniques to answer questions about, "What happened?" and, "When?" in the geologic past! Science of Taste (of Beer) - Beer tasting and judging uses all of the senses to evaluate beer and its quality. The flavor of a beer depends on the taster's perception. The use of gustatory, olfactory, and trigeminal senses help us to perceive flavor. There is a lot of research in this field but individuals are unique in how they perceive flavor. There are many chemical compounds and combinations of compounds found in beer that will alter the flavor and the quality of beer based on the style and local palate. 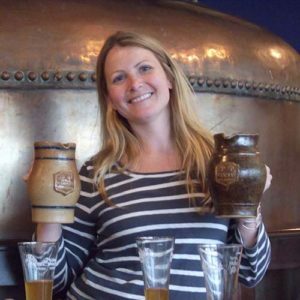 About Jennifer: I am the director of the USFSP Brewing Arts Program. I am a microbiologist by training and a certified beer judge.